Drag the point to see the relationship between the angle in standard position and the reference angle. Notice how the formula to find the reference angle changes. After playing with this, answer the questions at the bottom in your notes. 1. 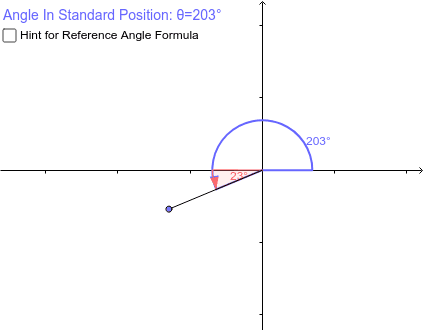 Where is the angle (in standard position), the same as the reference angle? 2. Is there a maximum angle that the reference angle can be? What is it? 3. If the angle in standard position is θ, write a formula for the reference angle in terms of θ for an angle in the... a. First Quadrant? b. Second Quadrant? c. Third Quadrant? d. Fourth Quadrant? If you need help... click the hint checkbox above.